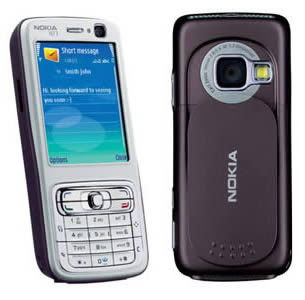 The N73 is billed by Nokia as the complete multimedia phone. It comes with a 3.2 megapixel camera, including a Carl Zeiss lens, an MP3 player and radio which play out of integrated stereo speakers with 3D sound. The big drawer for many people will be the integration with Flickr, making sharing your photos really easy. It's a 3G phone and has a secondary camera mounted by the screen for video calls, as well as all the Symbian S60 functionality of mobile email, and applications such as Real Player. It's available in three different colour combination - silver and plum, white and red or white and brown. It also comes with Nokia's Lifeblog, which is based on LiveJournal. It allows you to post items from your phone, including SMS, MMS and audio, onto your existing LiveJournal. If you don't already have an account, you can sign up from your phone and get started almost instantaneously. For avid mobloggers, there's an application which displays a timeline of all your activity from the day - the texts you received, the photos you took etc, which you can then go through and post to your blog. Finally, I get my new hp Nokia N73..! After I won top award Telenor Co., I happy to get new nokia N73! I really happy!! and very enjoy to celebrate with my groupmate, Chean SiaoYing! Before SiaoYing and I get the present, I surprised when I suddnelly get first place of Award Telenor! :O ^ ^ I really lucky! I am very hardworking and busy do D-HearT community for Mobile Telenor..D-HearT community can help to bulid the communication between hearing and deaf community~ SiaoYing and I work together in a group D-HearT..lol I am leader..haha because I also give creative ideas and busy to design sign language and doing many scripts in mobile lite.. @_@SiaoYIng busy to do many works too. She is very good in design icons and graphic. She also learn the sign language from me.. SiaoYIng and I really can communicate each other..She fast learn and can remember so easy after four months only! haha..It is not easy for our group do "Digital Community" together... Since SiaoYing and I always have presentation.. She is helping me to explain more about D-HearT..We really scared because Telenor people will come to our presentation FYP! 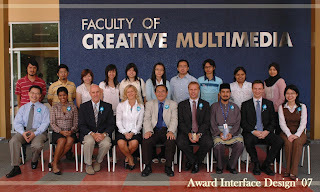 My picture: Award Telenor for Interface Design students won 1st place - 5th place only.